It has been more than three months since Stephen Curry and his Golden State Warriors clinched the NBA title. Sure, after that there was the NBA Draft and later free agency to keep us entertained but, alas, no NBA basketball. The circus starts all over again on September 26, when Training Camps open for all teams participating in preseason NBA Global Games, with all other teams following September 29. With a slew of new faces in new places, the NBA landscape is nothing like it was 12 months ago. Just like last year and the year before, I will select seven teams that I believe will take steps forward from last season. 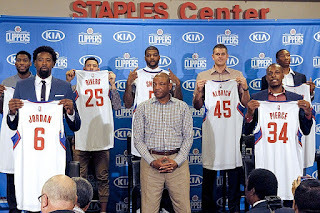 The Los Angeles Clippers were nothing to scoff at last season. The team owned by former Microsoft CEO Steve Ballmer won 56 games, grabbing the #3 seed in the Western Conference and reaching the WC Semifinals after a thrilling 7-game series against the defending NBA Champion San Antonio Spurs. The Clips would even build a 3-1 series lead against James Harden's Houston Rockets before losing the next three. The goal of Doc Rivers to summer? To shore up his bench and surround franchise cornerstones Chris Paul and Earth Quake Blake Griffin with the necessary pieces for a charge to the mountaintop. And oh, how he delivered. Rivers' most spectacular coup? Stealing center DeAndre Jordan back from the Dallas Mavericks. In what turns out to be one of the weirdest free agent stories in recent memory, the center agreed to a 4-year, $80 million deal with Cuban's Mavs, only to renege on his verbal commitment and re-up with the Clips on a 4-year, $88 million deal. Since the team would have had a massive hole in the middle had Jordan not returned, his "InDecision" was of great importance. What's even better for the Clips is that the whole ordeal has allowed Jordand and CP3 to clear the air between them. Their chemistry should be just fine. DJ joins fellow mainstays J.J. Reddick, Glen Davis, Austin Rivers (re-signed), Hedo Turkoglu, C.J. Wilcox and Jamal Crawford. Gone are Matt Barnes and Spencer Hawes. The duo was traded to the Charlotte Hornets in exchange for former Pacers standout Lance Stephenson. His wing defense and playmaking should be valuable fro the Clips. The small forward slot benefits greatly from the additions of former #4 pick Wesley Johnson (1-year, minimum deal) and veteran Paul Pierce (3-year, $10 million deal with a player option), while the big man rotation was bolstered with former Hawk/Piston/Rocket Josh Smith, ex-Knick Cole Aldrich and veteran Chuck Hayes. Pablo Prigioni and Branden Dawson, this year's #56 pick, round out the roster.